Loving all things midcentury, Laird Memory and her husband, Matt Bunting, updated their circa-1951 ranch off Collier Road while keeping the era’s cool vibe. The remodeled dining room (which was once a porch) features 11-foot-tall ceilings, oversized windows, and some sassy decor. 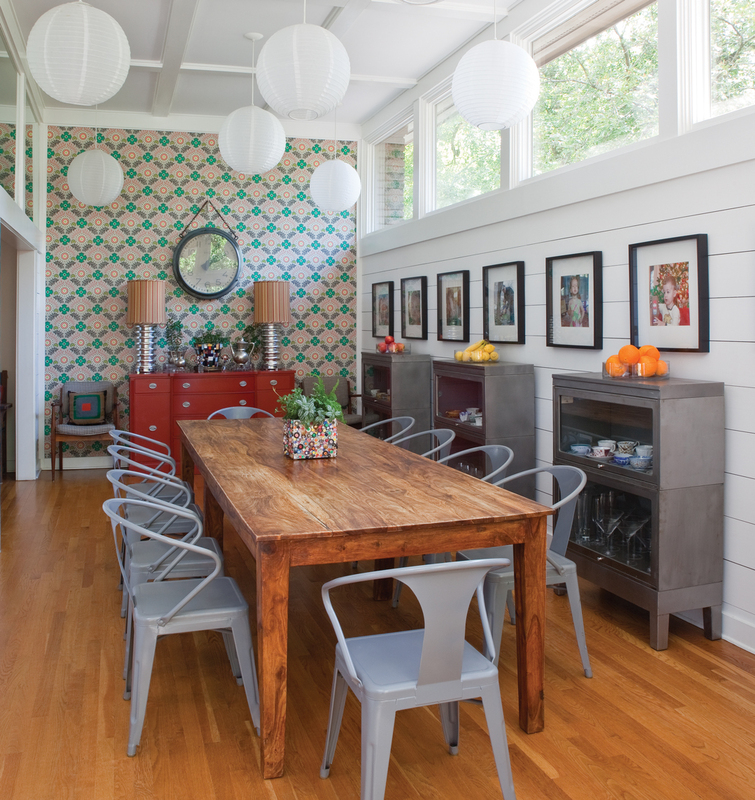 “I wanted to bring more energy and color into the dining room,” says Memory, who installed the medallion print from Spoonflower.com herself on an accent wall. Multiple globe light fixtures are actually simple pendant lights covered with Ikea outdoor shades. Dining chairs are former restaurant seats Memory spotted on Craigslist and painted gray. A French clock was bought at an antique store; its authenticity beats out ubiquitous, mass-produced versions. Memory made the mosaic flower pot, and she and daughter Raleigh crafted the button flowers. Old silver pieces are elevated on vintage glass ashtrays as another offbeat touch. A decade ago—before it was a thing—the couple’s architect, Jack Davis, suggested wood planking as an architectural feature. A mahogany chest inherited from Bunting’s grandparents was professionally lacquered in red, and the hardware was refinished from brass to nickel. Lacquered pieces are inherently showy, so go ahead and pick a bold color. “I knew it had to be red,” says Memory.